With the movie opening Nov 1st, Ender's Game is the #1 selling book on Amazon. Although Orson Scott Card's breakthrough novel is relatively tame compared to other adult sci-fi, there are a few things parents should be aware of. The first time I read this was in college. Card is a master storyteller if he can manage to keep his plot in a straight line. It's easy to fall in love with Ender and easy to see why this novel rocketed Card to fame and fortune. What's less easy to see is why an author so opposed to gay marriage fills his books with references to the male genitalia. This book is appropriate for most older teens. As for the rest in the series, they are less kid-friendly. Not because they have more adult content (although some do) but because the stories get more political, philosophical, and family-drama-esque. 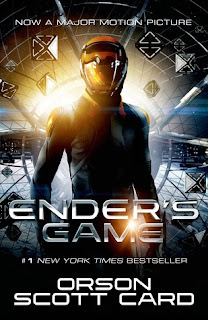 Ender's Game gets a (PG-13) rating for content. I know. When are you going to take me to see it? !